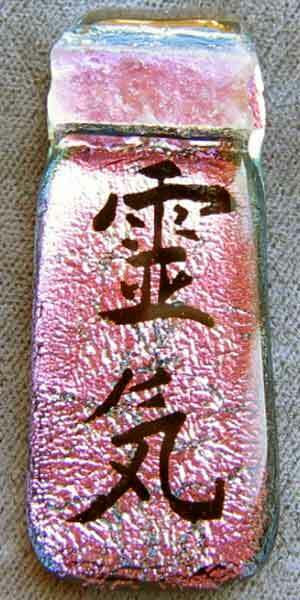 The REIKI symbol for hands on healing is etched onto glass and fused into a pendant in a high temperature kiln . 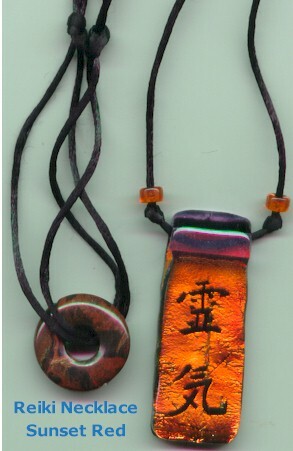 Pendants are fused onto opaque glass. The dimensions are about 2-1/8x7/8". Reiki pendants with a satin cord are $30. each. To have them ready to wear with a gemstone and adjustable cord, the price is $33. each. A few words about dichroic glass and color variation. I offer my dichroic pendants in assorted colors but these colors are as close to the examples above as I can make them Sometimes a sapphire blue piece will come out more cobalt blue and a turquoise piece come out light sapphire blue. From pendant to pendant sunset red can vary from red to orange red not unlike a real sunset. This is due to color variations in different batches of dichroic glass offered by the supplier and the amount of craze ( this is the crackle effect) developed by the dichroic as it reaches fusing temperature. Sometimes even 2 pendants from the same piece of dichroic come out different due to the dichroic coating. Other factors affecting the colors are kiln temperature, firing time, and the number of times a piece is fired. Therefore, I will refund your money if you are not 100% pleased with your purchase. This Page Last Update: February 04, 2007.